Before you awaits a wonderful world of catching and trading Pokémon! Let me guide you through the basics! •You receive your trainer license upon encountering your first pokemon. Hunt in the RMRKMon boards and you should encounter one in no time! •RMRKMon trainers are based in 2 regions - Tyria and Lisera. Some pokemon are exclusive to each region! You must trade with each other to complete your Pokedex! •3 records are kept for you - Pokemon that you've seen, a Pokedex, and your current inventory. •Once you have your trainer license, access your PC to choose your trainer picture. You can also choose your favourite Pokemon to stay by your side! 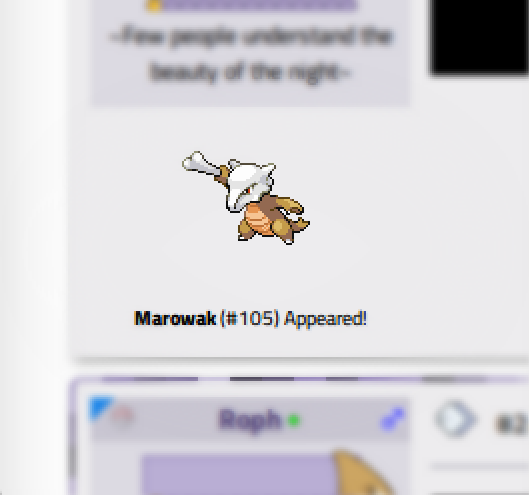 •As long as you are logged in and browsing forum threads, Pokemon have a chance to appear alongside posts on the RMRK forums. •Some Pokemon are more common than others. You will encounter more Zubats and Taillows than the elusive Articuno or Registeel. Some mythical, ultra-legendary pokemon cannot be encountered at all! •Ultra-rare, alternate-coloured shiny versions of all pokemon exist. You are incredibly lucky if you manage to find a shiny pokemon! 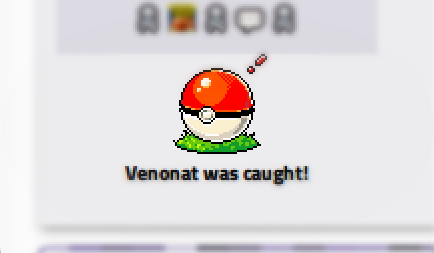 •Click an encountered pokemon to throw your Pokeball and try catching it! •Your Pokeball must recharge over time. If you've very recently caught a Pokemon it will be quite difficult to catch another again so soon. •Trainer licenses automatically include trading privileges! •If a trainer is open to trades or has you as a friend, Open a trade with them from their profile. 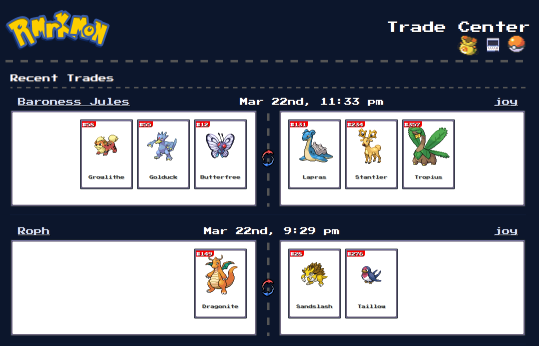 •You can trade up to 25 Pokemon at once in a single trade, and participate in 5 trades at the same time! •All completed trades are added to the public trade register, for all to see. RMRKMon Board | RMRKMon is an RMRK feature.